Barron’s has a lead article titled “Invest in Japan.” What do you think? Time to jump in after the huge tragedy? From my own experience, tragedies are one of the best times to jump in. Take 9/11, quick slide, nice and quick recovery. Will Japan be the same? Nobody really knows, especially with the current level of uncertainty. If you do want to invest, as I’m thinking about it, I think investing in ETFs is the smart way to go. But looks like the best one, and also part of Kiplinger’s 25, and one that I own, is Marsico Global Fund (MGLBX). While at the Barnes & Noble today, I got drawned in by a title in US World & Reports: The 100 Best Mutual Funds for the Long Run. Sure enough, I found a few funds that I think are top quality. Comparing it to Fidelity Contrafund, which is considered one the top funds, I can see why Yacktman is on top: 3 year return of 8.9% is much better than -0.2% for the Fidelity fund. Very good returns. Better than Marsico Global, also a top rated fund. In my retirement accounts, I only hold Mutual Funds. Why? More security. More diversity. I’m also open to holding ETFs, which are almost like Mutual Funds, but I try to stay away from stocks. It’s good to rebalance every year or so. It’s been a while since I’ve done it. But because we had a decent dip recently, I think it might be a good time for me to do so. Plus, I have come across some excellent Mutual Funds in the Kiplinger’s magazine — I always try to buy their yearly issue focused on Mutual Funds. Here are some funds which I like and which I picked mostly from that issue. I’m entering trades as I’m writing this post. A pair of the best and most famous bond funds, as per Kiplinger’s. Another of our favorites, same source. The portfolio of Harbor more or less reflects the distilled wisdom of Bill Gross and his colleagues at Pimco. Kiplinger’s top 25 pick. For added security, it’s always have to have some TIPS. Recently reopened. Kiplinger’s Top 25. Kiplinger’s Top 25. Impressive returns. Very good returns. Kiplinger’s top 25 pick. Good returns as well. I like it. Coming from the Feb 2010 SmartMoney magazine. Is It Time to Buy a House Yet? Not according to this chart. 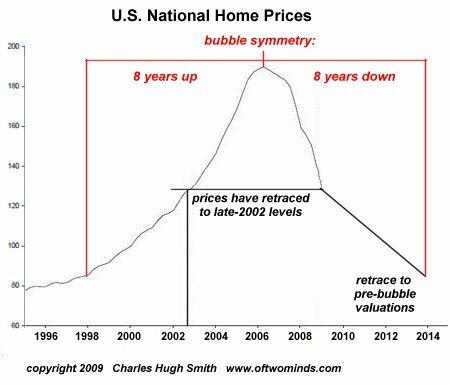 This article, Is It Time to Buy a House Yet?, was part of today’s Must Read newsletter from Seeking Alpha (a good resource for investors). It caught my attention. I like to read stories about housing. But what really caught my attention was the chart you just saw. Do we really have a few more years of downturn? I think so. I don’t think we’re out of the woods yet. But as with everything, and especially money issues, you never know. Mr. Smith does have some valid and interesting points. Here a few. Simply put: if the bubble took seven years to reach its blow-off top, then its decline will typically take a similar length of time as prices fully retrace to pre-bubble levels. As for supply: it is common knowledge that hundreds of thousands of homes are currently in the limbo of “shadow inventory”–homes the lenders won’t foreclose on for fear they can’t be sold, homes held off the market by owners who are deeply underwater on their mortgages, etc. As soon as demand appears, then supply rockets up as those anxious to sell move properties from the “shadow inventory” into the market. Where to be in 2010? Investor picks. Mauldin recommends putting money temporarily in short-maturity corporate and municipal bond ETFs like Vanguard Short-Term Bond (BSV) and Market Vectors Short Municipal (SMB). He sees the economy headed for a second recessionary dip later this year, and so recommends rotating into defensive funds — particularly, high-dividend-payers like Utilities Select Sector SPDR (XLU) or iShares S&P Global Utilities Index Fund (JXI). Mauldin also likes health-care funds, especially those with biotechnology exposure such as Health Care Select Sector SPDR (XLV). He is bullish on biotech: One of the purer plays is iShares Nasdaq Biotechnology Index Fund (IBB). Longer term, Mauldin recommends gradually shifting portfolio weights from securities of developed countries whose valuations “are out of whack” toward higher-growth markets through ETFs like iShares MSCI Emerging Markets Index Fund (EEM) or Vanguard Emerging Markets (VWO). Anticipating prolonged weakness in the U.S. dollar, Blumenthal recommends gradual acquisition of Pacific/Asia commodity producers/users represented by ETFs like iShares MSCI Pacific ex-Japan Index Fund (EPP). He finds the iShares MSCI Australia Index Fund (EWA) particularly attractive as a simultaneous play on commodity-rich Australia, its relatively strong currency, and China. A rebound in China, the world’s largest commodity consumer, should lift Market Vectors Steel (SLX) and Market Vectors Coal (KOL) as well as agriculture. CMG recommends Market Vectors Agribusiness (MOO), PowerShares Water Resources (PHO) and, for exposure to so-called soft commodities like rice and cotton, Elements/Rogers International Commodity Agriculture ETN (RJA). “Sell the rallies and trade tactically until we get a correction,” Blumenthal advises. In other words, take profits when common measures of investor sentiment are bullish, and shop for bargains on market dips. Thomas Orecchio, Modera Wealth Mgmt. He uses international bond funds like SPDR Barclays Capital International Treasury Bond ETF (BWX) to balance U.S. dollar-heavy portfolios. Even though their share prices have run up lately, developing countries have better growth prospects than developed economies, he says. Modera also is rotating into international bond funds like iShares S&P/Citi International Treasury Bond (IGOV) and SPDR Barclays Capital International Treasury Bond ETF (BWX) for fixed income, but gradually. Here are some funds that offer diversified exposure to the emerging markets in Europe, Asia, Africa/Middle East, and Latin America. These are taken from the latest BusinessWeek, Dec 28th edition. There is a very good article on investing in the latest Kiplinger’s (Feb 2010) “Make A Buck Off A Sagging Dollar.” Their view is that the dollar is on the decline, and you better diversify. They have a few suggestions how you can do that. I also think the long term the dollar does not look so good. Especially when comparing it to emerging markets. You can invest in emerging-markets bonds through Pimco Emerging Local Bond (PLBDX). “Pimco invests in 15 markets, including Poland, South Africa, Mexico, and Thailand.” It’s on the expensive side, though, with an annual cost of 1.35%. I try to stay under 1%, but this might be worth the price. For a lower cost alternative, check Wisdom Dreyfus Emerging Fund (CEW). “This exchange-traded fund, launched last summer, uses futures contracts to provide exposure to money-market rates of 11 emerging markets currencies, including the Polish zloty, Chinese yuan and Chilean peso.” Annual fee is 0.55%.